​Site of landing in New Jersey on night of December 25, 1776, of George Washington's soldiers after crossing Delaware River from Pennsylvania on their way to attack British and Hessian soldiers in Trenton, some ten miles south of landing site. Landing site then known as Johnson's Ferry, now part of New Jersey's 3,000-acre Washington Crossing State Park, Pennsylvania side of Delaware also 500-acre Pennsylvania Historic State Park. Washington initiated assault to restore sagging morale of troops, promote re-enlistments prior to expiration of soldier enlistments at end of year. New Jersey Park Visitors Center features exhibits focusing on military campaign known as "The Ten Crucial Days" from December 25, 1776 through January 3, 1777, comprising Continental Army's crossing of Delaware River and Battles of Trenton and Princeton. Center open daily 9:00 am - 4:00 pm, year round. Johnson Farm House in Park owned by Garret Johnson, who operated a 490-acre colonial plantation and ferry service across river in 1700s, likely used briefly by Washington and other officers at time of Christmas night crossing, includes keeping room, bedchamber and textile room furnished with local period pieces similar to furniture used by the Johnson family, site also includes an 18th-century kitchen garden. New Jersey Park also includes outdoor theater which presents performances from spring to fall. Pennsylvania and New Jersey parks site of annual re-enactment on anniversary of Crossing. Johnson Farm House in Park owned by Garret Johnson, who operated a 490-acre colonial plantation and ferry service across river in 1700s, likely used briefly by Washington and other officers at time of Christmas night crossing, includes keeping room, bedchamber and textile room furnished with local period pieces similar to furniture used by the Johnson family, site also includes an 18th-century kitchen garden. New Jersey Park also includes outdoor theater which presents performances from spring to fall. Pennsylvania and New Jersey parks site of annual re-enactment on anniversary of Crossing. Revolutionary War site of George Washington's December 26, 1776, attack on Hessian mercenaries billeted in building following Washington's crossing of Delaware River on previous evening. Washington's troops captured 30 officers, 918 soldiers and Loyalists, 40 horses, 1,000 muskets and rifles, six cannons and six wagons. 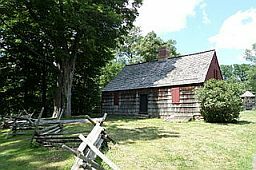 Structure originally constructed 1758 during French and Indian War by colony of New Jersey responding to complaints by residents objecting to compulsory quartering of soldiers in their own homes, only surviving one of five such barracks built at that time in New Jersey. 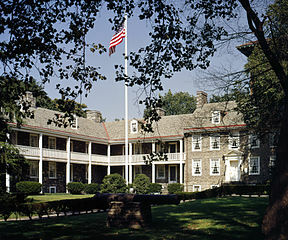 During Revolution, at various points barracks used by both British and Americans, with British prisoners of war held in Officers' House and in 1777 as Continental Army hospital. In December 1776, British and Hessian troops occupied Trenton, and briefly stayed in Barracks prior to Battles of Trenton. Colonial Loyalists seeking British protection also believed to be staying at Barracks when Washington's troops crossed Delaware and marched from north into Trenton. After Battles of Trenton and Princeton, Continental soldiers returned to Trenton in January 1777 and used Barracks primarily as hospital where soldiers inoculated against smallpox. After the War, building uses for such purposes as homeless women's shelter, residence of the first mayor of Trenton, and a boarding school.​ In early 20th century, restoration efforts led by Daughters of American Revolution which established nonprofit Old Barracks Association, purchased in 1902 southern portion of original Barracks and in 1914 state government bought north section, with Old Barracks Association agreeing to transfer ownership of their portion on condition of being allowed to operate building as museum. Old Barracks Museum, located 100 yards from current State House, open daily except Sunday year-round, advance reservation for groups of 15 or more.​Trenton Battle Monument--a 150-foot tall column topped by bronze statue of Washington directing cannon fire located several hundred yards east of Barracks--marks site of Continental artillery emplacement, with one detachment commanded by Alexander Hamilton, dedicated in 1893 ceremony attended by eight governors of original thirteen states. 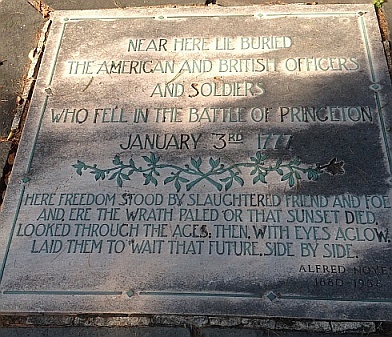 Also known as Second Battle of Trenton, took place in week after Washington's crossing of Delaware to attack Hessians when General Cornwallis marshaled some 9,500 of 11,000 British troops in Princeton and marched south to confront Washington, who had built a defensive position south of the Assunpink Creek in Trenton. The Continental forces repulsed several Cornwallis assaults attempting to cross the Creek, and at night Washington slipped undetected around the British lines to march north to Princeton, where Cornwallis had left the remainder of his army. 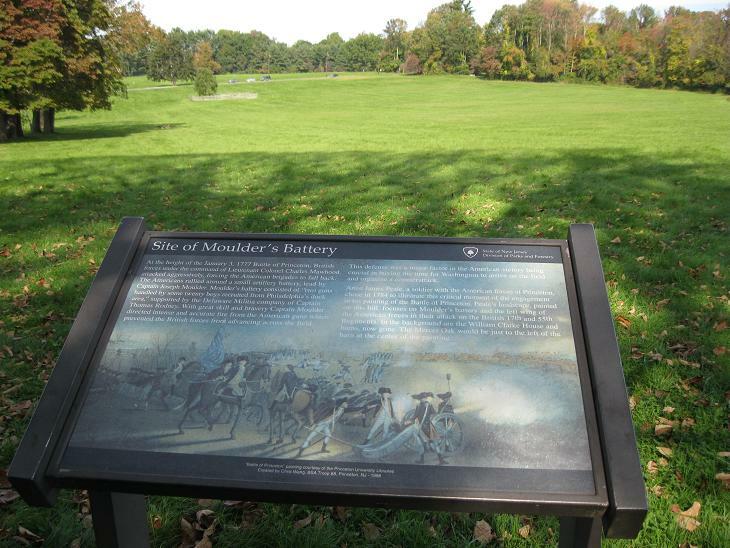 Site of Battle of Princeton on January 3, 1777, ten days after Washington's crossing of Delaware to attack Hessians at Trenton and following successful defense on previous day by Washington of counter-attacks by Lord Cornwallis at Assunpink Creek in Trenton. Continental General Hugh Mercer commanded during first phase of battle and was severely injured in bayonet assault. Battle turned when Continental reinforcements arrived with Washington from Trenton. Mercer was carried to farmhouse at edge of field built by Thomas Clarke in 1772, died in house nine days after battle. House open for public visits, Park also site of annual re-enactments of Battle. Site of Continental army’s winter encampment of December 1779 to June 1780. Park includes Washington's headquarters, other historic homes, reconstructed tavern, military barracks and hospital, cannons, fortifications and parade ground. Washington resided with wife Martha and military aides in Ford Mansion, originally built in early 1770s for iron manufacturer and Revolutionary militia officer Jacob Ford, Jr.
After Ford's death in 1777, his widow offered house to Washington as headquarters during winter encampment while she moved into two rooms with her four children. Ford family and descendants continued to live in house until 1870s sale at auction to wealthy residents who formed nonprofit Washington Association of New Jersey to preserve house, later donated house and collections to National Park Service in 1933. House furnished to reflect 1770s, shown in guided tours which begin in museum building. Museum building designed by noted architect John Russell Pope, who also designed Jefferson Memorial in Washington, features exhibits of furniture, weapons, documents and other 18th century objects. Park also includes Wick House built between 1747 and 1750, which served as officers' headquarters of Major Joseph Bloomfield of Third New Jersey Regiment during winter of 1776-1777 and of General Arthur St. Clair in 1779-1780 winter encampment. House open to public, furnished to portray its use as a general's headquarters. Washington also ordered construction nearby of fortifications on hill overlooking Morristown, later known as "Fort Nonsense," also administered by National Park Service and open to visitors. 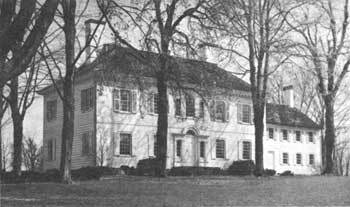 Park also includes Wick House built between 1747 and 1750, which served as officers' headquarters of Major Joseph Bloomfield of Third New Jersey Regiment during winter of 1776-1777 and of General Arthur St. Clair in 1779-1780 winter encampment. House open to public, furnished to portray its use as a general's headquarters. Washington also ordered construction nearby of fortifications on hill overlooking Morristown, later known as "Fort Nonsense," also administered by National Park Service and open to visitors. Fort built commencing July 1776 on bluffs of Palisades at Hudson River on orders of General George Washington intended, along with Fort Washington constructed on New York side of River, to protect lower Hudson from British warships. Originally named Fort Constitution and situated in what was then Hackensack Township at ferry wharf known as Burdett's Landing, renamed Fort Lee after Continental General Charles Lee. After Continental troops were defeated and captured at Fort Washington on November 16, 1776, 5,000 British and Hessian soldiers ferried across River to invade New Jersey, with Washington ordering evacuation of Fort Lee on morning of November 20, retreating southwest to New Brunswick and eventually across Delaware River to winter encampment at Valley Forge. Park operated by Palisades Interstate Park Commission, Visitor Center open Wednesday through Sunday. Situated west of Park is 700-acre Monument Park, dedicated in 1908 by Daughters of the American Revolution, site of original Fort Constitution, only park in nation dedicated to soldiers of American Revolution. Site of Fort Mercer, built in 1777 on New Jersey shore of Delaware River along with Fort Mifflin on Pennsylvania side, on orders of General George Washington to strengthen defense of Philadelphia. Located in what is now National Park in Gloucester County north of West Deptford. Fort Mercer named in honor of Brigadier General Hugh Mercer who was mortally wounded in January 1777 at Battle of Princeton. Property originally acquired and large brick home built 1748 by James and Ann Whitall, Quakers who established 400-acre plantation with fruit orchards, lumber mill, shad fishery and ferry. On October 22, 1777, 900 Hessian soldiers were repulsed in assault on Fort by 600 soldiers of Continental Army regiment from Rhode Island, with Whitall home serving as field hospital and Ann Whitall nursing soldiers of both sides. Many Hessians remain buried north of home. In next month, Fort Mercer evacuated after loss of Fort Mifflin and landing nearby on November 18, 1777 of 2,000 British troops commanded by Lord Cornwallis followed by British occupation of Philadelphia. Site currently includes 44-acre Gloucester County Park with Whitall House, museum and gardens (open spring to fall), monument, cannons and walking trails. Battle annually re-enacted in October, other special events and demonstrations of colonial cooking, crafts etc. conducted by volunteers. Fort built 1896 as part of a coastal defense system for Delaware River developed in late 1800's in anticipation of Spanish-American War, with troops regularly stationed at Fort from 1897 to 1922, followed by small caretaking detachment from 1922 to 1943. New Jersey acquired property as a historic site in 1947, opened to public in 1951, currently operated by New Jersey Division of Parks and Forestry as part of 106-acre Fort Mott and Finns Point National Cemetery District. Parapet composed of poured concrete with 35-foot thick wall. Visitor Center features exhibits on New Jersey's Coastal Heritage Trail and history of Fort. Open for self-guided tours, school and other group guided tours by prior arrangement. Finns Point Lighthouse erected in 1876 located just outside Park. Federal government originally purchased land for artillery installation at Finn’s Point Battery to protect Port of Philadelphia, but during and after Civil War it was used as burial site for over 2,500 Confederate prisoners of war who died while imprisoned at Fort Delaware, as well as 125 Union guards who died at the Fort, dedicated 1875 as ﻿﻿Finn's Point National Cemetery﻿ ﻿and placed on National Register of Historic Places in 1978. Nation's only tri-service joint base. Effective in 2009, three previously separate military facilities of Fort Dix, McGuire Air Force Base, and Naval Air Engineering Station Lakehurst reorganized as joint operation under Air Force lead pursuant to recommendations by Base Realignment and Closure Commission. Force levels comprised of Active Duty, Reserve, and National Guard military personnel along with significant Marine Corps and Coast Guard assets. Fort Dix and McGuire cover 60 contiguous square miles in Burlington and Ocean Counties, Lakehurst sited to east in Ocean County. Originally established as Camp Dix during World War I, named for Major General John Adams Dix, veteran of War of 1812 and Civil War who also was US Senator, Secretary of Treasury, Minister to France and Governor of New York. During World War I, Dix a training and staging ground, became largest military reservation in Northeast. After end of War, Camp became a demobilization center processing soldiers for discharge. In period between world wars, a training facility for active Army, Army Reserve and National Guard units, and from 1833-1941 also a training and discharge center for President Roosevelt's Civilian Conservation Corps to provide jobs for conservation and maintenance of parks and forests. 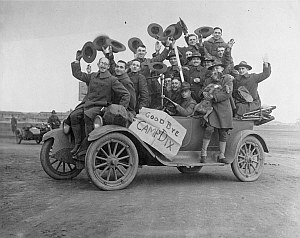 In 1939, Camp Dix renamed Fort Dix as it became a permanent Army post serving as a reception and training center for men inducted under draft of 1939. In World War II, became principal training center prior to soldiers being deployed abroad. At end of War, reception center processed over 1.2 million soldiers for discharge to civilian life. During post-War years, served at different points as basic training center and home of 9th and 69th Infantry Divisions. During Vietnam War, soldiers received Vietnam-specific training, including at model village constructed on site, before overseas deployment. Also played major roles in Middle East conflicts in 1990s, deploying troops for Operation Desert Shield and Desert Storm. Ended its active Army training mission, but became center for training, mobilization, deployment, and demobilization of reserve component forces, many of whom played substantial roles in Middle East conflicts in 1990s and 2000s in Operation Desert Shield and Desert Storm, as well as providing support for operations in Somalia, Bosnia and Kosovo. Only Air Force base in New Jersey, located 18 miles southeast of Trenton,on over 3,500 acres in Burlington County within Pinelands National Reserve, bordered to east, south and west by Fort Dix. Established in 1941 as Fort Dix Army Air Force Base, during World War II a training and support facility for First Air Force; base for offshore anti-submarine patrols and protection of friendly shipping; and maintenance center for servicing and preparing aircraft for overseas deployment and deactivation after return from abroad. Closed briefly after World War II, reopened in 1948 as McGuire Air Force Base named in honor of Major B. McGuire Jr., of Ridgewood, a posthumous Medal of Honor recipient who was second leading air ace in World War II. McGuire AFB is the home of the 305th Air Mobility Wing. After modernization of runways and other facilities, in 1950s to serve jet aircraft, designated as headquarters for Military Air Transport Service and its successor units, transported military cargo, weapons, mail and passengers worldwide, including to Southeast Asia combat areas during Vietnam War. In 1959, Bomarc nuclear long-range surface-to-air missiles deployed four miles east of main base at McGuire, Within year of becoming operational, Bomarc with nuclear warhead caught fire in June 1960 as a result of explosion of its onboard helium tank, with heat melting warhead and releasing plutonium which was subsequently covered with concrete under supervision of Atomic Energy Commission. Bomarc installation deactivated in 1972, but site of spill remains off limits due to low levels of plutonium contamination. In 1999, McGuire served as lead staging base for evacuation of Kosovo refugees, also staging point for FEMA operations in New York City after September 11, 2001 terrorist attacks. Continues operations of regular deployments of airlift and aerial refueling aircraft as well as support elements for combat operations in regional conflicts abroad. Located in Ocean County, forest site originally used as remote ammunition proving ground for Russian Imperial Government in 1915. In World War I, acquired 1917 by US Army as ammunition proving ground and poison gas warfare testing ground, continued as a test site for ammunition and poison gas until 1921 when commissioned as Navy air station. Became center of US airship development, housed three of Navy's four rigid airships, with a number of airship hangars still remaining, also base for many Navy non-rigid airships or "blimps" before, during, and after World War II. Best-known as site of Hindenburg disaster when German airship burst into flames when hovering to land on May 6, 1937. In 2006, Navy resumed airship operations at Lakehurst. Base also currently used for various Naval Aviation development programs utilizing its own runways and control tower for testing new aircraft recovery and carrier flight deck catapults and arresting gear. Historical tours of Navy Lakehurst facilities including Hindenburg crash site conducted by Navy Lakehurst Historical Society by appointment made two weeks in advance, on-site museum also includes uniforms, replica gondola of Hindenburg made for motion picture. Located at north end of Sandy Hook at strategic point protecting entrance to New York harbor. 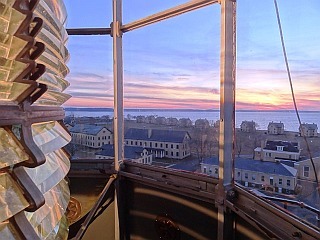 Sandy Hook Light first built 1764 by Colony of New York to guide shipping financed by lottery sales, oldest operating lighthouse in US. 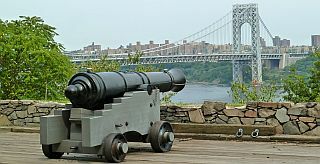 During War of 1812, a wooden fort named Fort Gates constructed, with lighthouse also armed with cannon. Federal Government completed purchase of peninsula in 1814. In 1859, "Fort at Sandy Hook" began to be built by Army, but never completed, and not until 1890 that many concrete gun batteries were installed. Army also created in 1874 its first proving ground for testing weapons, Sandy Hook Proving Ground, which remained until relocation after World War I to Aberdeen, Maryland in 1919. In 1895, Army renamed "Fortifications at Sandy Hook" as "Fort Hancock" to protect New York Harbor from invasion by sea, with buildings constructed largely between 1898-1910. 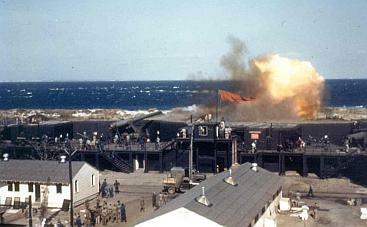 Fort peaked in World War II with garrisons ranging from 7,000 to 12,000 soldiers, including members of Women's Army Corps, and more than 30 barracks, administrative buildings and batteries of anti-aircraft guns. At end of War, served as reception center for soldiers returning from Europe. During Cold War between 1954 and 1974, site of Nike surface-to-air nuclear missiles. Army cutbacks began in 1960s, with base closed in 1974 and National Park Service assuming operation of all of Sandy Hook in 1975 as part of Gateway National Recreation Area in New Jersey and New York. Site currently includes remnants of Fort structures, and replacement missiles and launchers and radar antennas relocated from other locations to Fort. Visitors may tour gun batteries and post museum. Park Service attempting to restore remaining buildings through private sector partnership proposals. Remainder of peninsula serves as US Coast Guard Station Sandy Hook. Nonprofit Sandy Hook Foundation established 1989 to raise funds, promote preservation and sponsor events related to Park.